In 2017, the first 50, or so, reviews were gathered into an ebook. Nearly half of them have just recently been updated. if you have Kindle Unlimited. Find out more about it, and get your copy HERE. I began writing FreeFile Reviews in 2009, and published 57 reviews by the end of 2018. Now, I have decided to stop writing reviews, and to keep them available here. 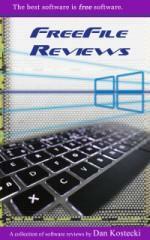 My interest waned as it seemed more difficult to find new and interesting software to review. Moving forward, I plan to focus more on woodworking, and plan to publish those projects on HayYoo.com. 57. Windows95 As An App - Useful or just a curiosity? 56. Icon Explorer enables the viewing, extraction, and saving of icons from programs. 55. Alternate Pic View is a simple picture viewer and manipulator - is it too simple? 54. iPhotoDraw does screen captures and annotations, real hidden gem. 53. Gravit Designer a vector graphics editor, is truly Illustrator for the rest of us. 52. DocPad - a 'not so' plain text editor. Check out what it offers. 51. nuePanel has more Windows tweaks and settings than most people will ever use. 50. XnRetro is a quirky little image editor, designed for mobile use - is it any good? 49. AbelWord may be the ideal lightweight word processor. 48. How users of Windows 10 can easily and effectively maintain security. 47. GFXplorer gathers system info, Windows tools and utilities in one convenient place. 46. Photo Pos Pro - a photo editor with issues. What is the bottom line? 45. Dual-panel File Managers - two Windows Explorer replacements are compared. 44. CherryTree - a note taking application and real hidden gem. 43. Slideshow Maker - one of the few completely free slideshow creator apps. 42. Windows 10 - is the free upgrade to Windows 10 right for you? 41. Hardwipe - a fast, reliable secure delete program that just works. 40. IrfanView - graphics viewer/editor and much more - best freeware ever. 38. Vivaldi - is it time to give up Chrome and FireFox for this new browser? 37. PhotoDemon is a basic photo editor. Is it too basic? 36. PicPick - a toolbox full of utilities for graphics/design work. 35. Easy Context Menu - adds several useful options to Windows right-click menus. 34. FastStone Image Viewer - a surprisingly impressive graphics editor. 33. Software Download Sites - the 4 absolutely best places to get free software. 32. Microsoft Office For Free? - Yes, free and legal - I'll show you how. 31. PDF-XChange Viewer - it's a PDF viewer and editor, with OCR - a must-have. 30. Pixlr - leading online image editor. Is it right for you? 29. AnyBurn - the best no-nonsense burning software I've ever used. 28. iGoogle replacements - what are the best options? 27. My Opinion - I give my 2 cents on the future of free software. 26. XnSketch turns any photo into a drawing. How does it perform? 25. GifCam allows anyone to create animated GIFs - check it out. 24. Team Viewer - top-notch remote support application that is totally free. 23. Calme (Calendars Made Easy) - a simple utility for printing calendars. 22. PC Image Editor - a simple image editor - is it any good? 21. Document.Editor - a word processor you probably never heard of. 20. Video Converter Showdown 2 - Two more video converters are compared. 19. The Gimp 2.8 - this leading photo editor has improved, but is it enough? 18. Invisible Utilities - three must-have utilities for Windows. 17. AbiWord - the leading free word processor gets the once over. 16. PixBuilder Studio - find out how this obscure image editor stacks up. 15. LibreOffice - need a free office suite? This is the one to get. 14. Serif PagePlus Starter Edition - is this desktop publishing program right for you? 13. Sudoku Puzzles - two sudoku puzzle programs are reviewed. 12. Audacity - is the only audio editor you need. Period. 11. Paint.net - is it the free replacement for Photoshop? Find out in this review. 10. Painting For Free - two natural painting freeware programs are compared. 9. 2011 Big Browser Round-Up - the latest versions of Chrome, Firefox and IE. 8. Display Calibration - get the most out of that big monitor. 7. FotoSketcher - super app that turns any photo into a hand-painted masterpiece. 6. foobar2000 - foobar2000 is the only audio player your PC needs. 5. Google Docs - do you need Google Docs? I give my 2 cents worth. 4. Video Converter Showdown - Two video converters go head-to-head. 3. Anti-Virus Toolkit - put together a solid defense against malware for free. 2. Data Recovery Shootout - which free app recovers deleted pics best? 1. Google Chrome Browser - is Chrome better than Firefox?